Be prepared to defend your honor with this Full Tang Ninja Sword with Oval Guard. The blade features seven silver-colored characters near the guard, giving it a distinct look. This sword has an oval guard and pommel with lanyard hole. The weapon is made from one solid piece of 440 stainless steel, giving you a strong and reliable blade. Black nylon paracord wrapped around the handle offers a secure, comfortable grip, so you will never have to worry about losing hold of your sword. 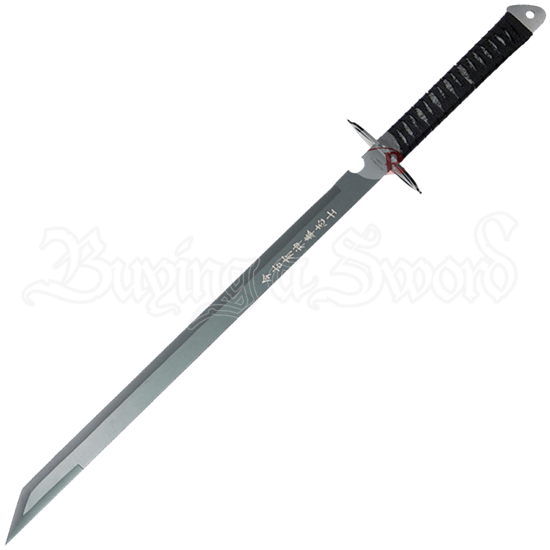 This sword includes a black nylon sheath with adjustable straps. Whatever the occasion, make sure you are always at the ready with this ninja sword.